ROAD TOWN, Tortola, VI - With the warning signs all out about the possibility of hurricane Irma unleashing its strengths on the Territory, the Minister for Communications and Works, Honourable Mark H. Vanterpool (R4), is urging all to be vigilant. The works minister was called upon to give remarks at a lunch meeting of the Rotary Club of Tortola, where it's new president Mrs Karia J. Christopher led the charge of the Rotary in saluting and honouring three groups of first responders of the recovery efforts after the August 7-8, 2017 flash flood that ripped through the island of Tortola and other areas of the territory. 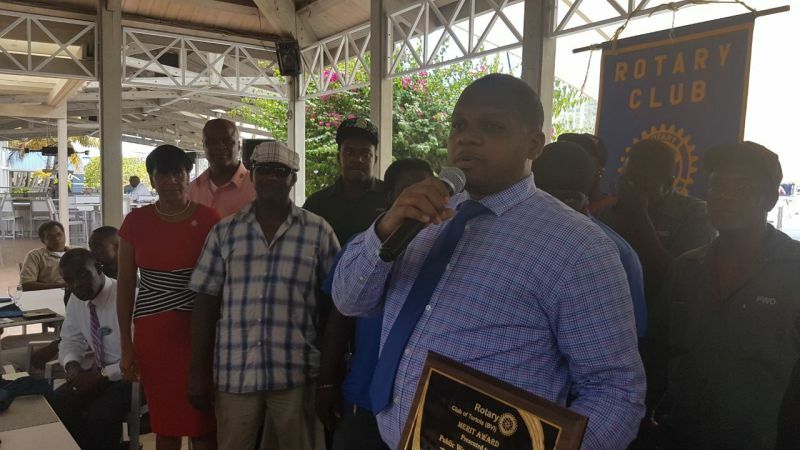 The three groups that were honoured on August 31, 2017 by the Rotary Club of Tortola are the Public Works Department of the Ministry of Communications and Works, Fire and Rescue Services and the BVI Electricity Corporation. "We cherish and appreciate from the bottom of our hearts the resilience shown by so many of our people who came out in their numbers and showed their support in so many different ways, helping to get us back to some level of normalcy, but today we are honouring these three frontline departments and we wish we could have given every organisation, company and persons who helped but we cannot but we want you to know we are honoured by your efforts and time committed too," Mrs Christopher said at the meeting. However, as Honourable Vanterpool commended the works done by the three groups and others, he took the opportunity to implore the entire territory to keep vigilant as hurricane Irma is being projected to hit the territory. "Let's keep vigilant," he said, "We still have lots more cleaning to do but we are still watching the weather that is coming along." According to Hon Vanterpool, "There are various controversial issues. We made the assessment early that we felt that we need to jump in and do it ourselves." In a burst of laughter, Hon Vanterpool added, "We might need to make sure the ship is out there anchored, the storm is coming so let's keep it close by Premier, in case this one is a big one." Premier and Minister of Finance Dr The Honourable D. Orlando Smith (AL), who was criticised for refusing disaster relief from a UK navy ship in the aftermath of the recent destructive tropical wave, was present at the meeting also in the capacity as a member of the Rotary Club of Tortola but he did not speak on this ocassion. Also speaking highly of all the recovery works put in by all and sundry, General Manager of the BVI Electricity Corporation, Mr Leroy A. E. Abraham admitted that his entity was "caught with its pants down" when the August 7-8 storm hit the territory. In commending the awesome work put in by a skeleton staff he had on duty at the time, as he told the audience that the bulk of his employees was away on vacation, leaving him with just about ten persons including one female to handle the restoration of electricity to the entire territory, Mr Abraham admitted, "we were caught with our pants down." "But we do what we do, 365 days a year, 12 months a year, rain sloop or snow based on climate change those of us who might not want to believe it, there might be some in the BVI." Mr Abraham also spoke of the selflessness of the BVIEC staff. "Sometimes with the passage of the storm we ourselves are affected but we selflessly go out and try to make sure electricity is restored to normalcy," he said while applauding his team as the "A" team in the territory. The management of Crandalls was also presented a plaque of honour at the Rotary Club of Tortola's special lunch meeting. 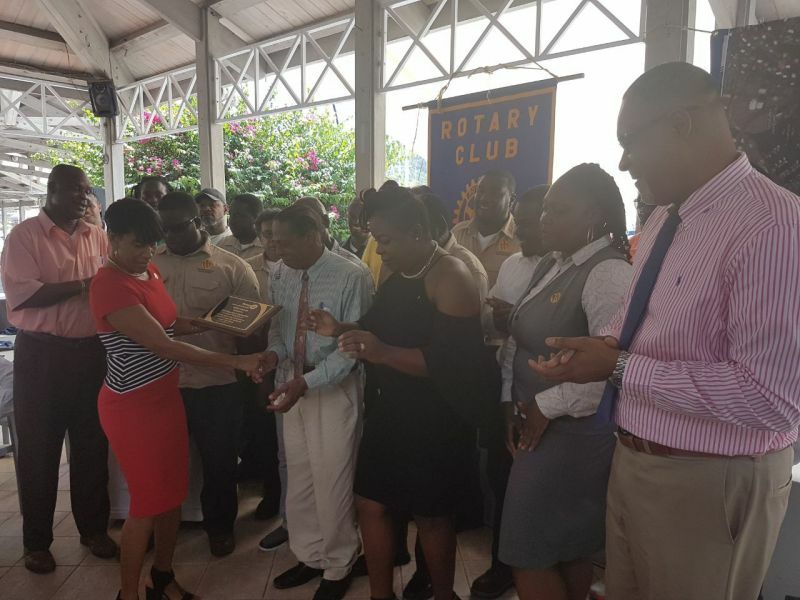 The entire rotary family in the territory were seen as being the first, along with others like the BVI Red Cross, Lions clubs among others, to immediately step into gear in coordinating the recovery efforts after the storm. Members from other rotary clubs were also among the audience applauding those being honoured. Rotary Club of Tortola, well done. Thank you Mrs. Christopher and entire Rotary group. We felt special and appreciated. Thank you so much. I am in agreement with Minister.. The ship might not offer next time around! Well done PWD and BVIEC these men and women deserve everyones praise and thanks. Keep up the good works I appreciate you all. Dispite being next door to PWD, There are cetain areas still without water. You sound so bitter. We didnt need the ship for a few flooded areas. People needed help getting back on their feet and with govt and donations along with insurance that is happening. On the other hand we are talking about a potential cat 4 hurricane hitting us head on with winds in excess of 140mph!!!!!! Step outside and take a look. We bounced back within a week and were back to business within days. The ship was NOT NECESSARY AT THE TIME. If you have a cut are you going to put a cast on it??? Come on man act right! You need to take a look. Have you seen the ghut up Purcell? one shower of rain and it's full again because they can't clear the blockage that's under their million dollar road. The storm may or may not hit us but, I started stacking up on bottled water and can goods in the event we get hit. People of the VIRGIN ISLANDS I received a word from the Lord for you last night "SET YOUR HOUSE IN ORDER!" Something BIG is going to take place in the Virgin Islands and God wants EVERYONE to be spiritually prepared! My heart weeps and my spirit is saddened when I see what is about to hit because people refuse to REPENT! God has been sending warnings and warnings of repentance. Yet many are not taking heed but are mocking and refuse to repent, refuse to turn to God. The wickedness continues to abound in high places and low places - in all areas of the society. The judgment of God has begun in the house of the Lord. God Himself will bring down. God Himself will remove. God Himself will shut down. God Himself will clean up. God Himself will clear up. God Himself will wipe out. God Himself will wash out. God Himself will cut off. I prayed and I asked God as I always do for mercy on the people and all I heard was "They are not taking heed!" PEOPLE OF THE VIRGIN ISLANDS BOTH BRITISH AND US VIRGIN ISLANDS - "SET YOUR HOUSE IN ORDER". Anegada, Tortola, St. John, Virgin Gorda, St. Thomas, St. John, St. Croix, Jost Van Dyke, and all the other islands in the Virgin Islands... A MAJOR SHAKING IS COMING!!! Dear Lord I pray for MERCY!!! SAINTS, PRAYER WARRIORS, INTERCESSORS IN THE VIRGIN ISLANDS IT IS TIME TO FAST AND PRAY AND ASK GOD FOR MERCY ON THE VIRGIN ISLANDS!!! OH DEAR LORD, PLEASE, PLEASE LORD, PLEASE HAVE MERCY!!! A cleansing could be coming to wash away the evil sins and wickedness being rendered soon each other here. Mother Nature isn't gonna do it with soap either. Don't want to hear nothing that man have to say. Just the other day he was singing a different tune. Opportunist. This refusal of needed help is not even funny ! The Potential for Hurricane got One Mart busy all day all night....Keep the Hurricane fire burning Minister... Good for you....Keep warning the people. It can get real serious... Good Job..
Whre is the governor? No arrest yet?